Malcolm Hoenlein: Saying 'I hate Israel' instead of 'I hate Jews' does not cover up the fact that both mean the same thing. “It is the same manifestation, except [it is] attacking the collective Jew - Israel - rather than the individual Jew as we saw 70 years ago,” Hoenlein said at a press conference in Jerusalem. The fact that it is not politically correct to say “I’m hate Jews” but is seemingly okay to say “I hate Israel” should not be used to cover up the fact that both statements mean the same thing, he added. 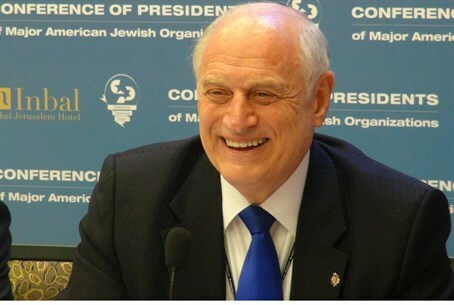 Referring to Iran, Hoenlein referred to the differences between Congress, where some members have been pushing for legislation that would impose new sanctions against Iran, and the Obama administration that has threatened to veto any new sanctions. Hoenlein said that Iran was not living up to its commitments, noting that not much has changed in the country since President Hassan Rouhani took over from Mahmoud Ahmadinejad. “[There have been] more executions under Rouhani than we saw under Ahmadinejad. It is outrageous that the world doesn’t challenge this,” he said, citing Iran’s human rights violations and support for terrorism. Hoenlein called for a unified approach on Iran so that the solution that everyone wants can be reached. “Iran represents a global threat. Every foreign leader we meet today talks about the danger they face from Iran,” he added.